Our mission is to develop well-rounded individuals who are prepared to meet life's challenges both on and off the field. We understand that it takes a village to raise a child and we hope to promote the values of good sportsmanship, teamwork, hard work ethic, and the pursuit of excellence through competitive soccer. Our hope is to build the foundation for which our players will be successful in all walks of life. Our vision is to be recognized as one of the best development programs in our area. The goal is to help promote athletes from our community to the next levels; PDP, high school, college, or professional development academies. We expect to compete with the best clubs in the North State and provide a platform for our players to be recognized. We consider The Academy Program to be the foundation of a players competitive playing experience. It is intended to bridge the gap for both boys and girls between our Juniors and Competitive programs. We believe in a progressive approach to development. Our goal is to provide the highest quality training environment for players U8-U10, while reducing the travel commitment from our youngest teams. 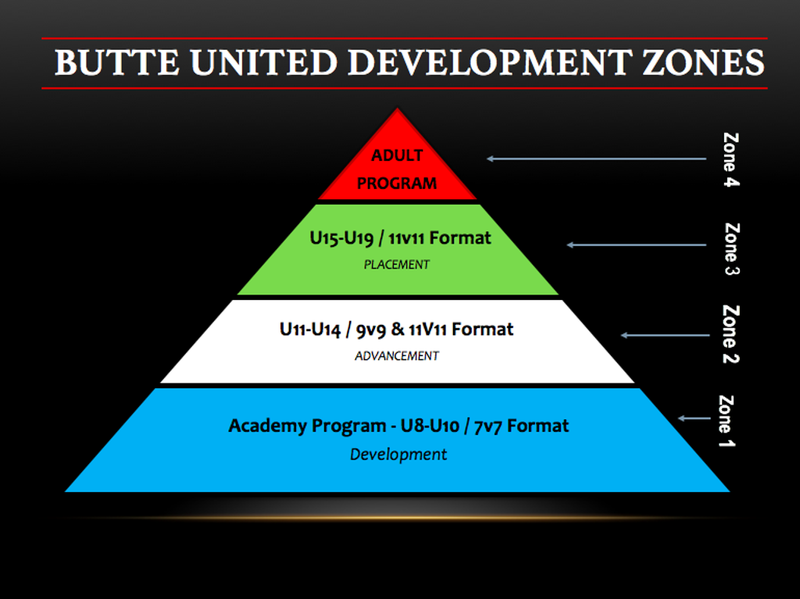 The Academy program is our introduction to the Butte United philosophy, style of play, and system. Our curriculum will focus on technical ball mastery and introduce functional team concepts. The 7v7 model allows our staff to address the technical and tactical building blocks which help our players prepare for the 11v11 game. These players will compete in a schedule of scrimmages and tournaments in a low-stress fun experience. the Academy program offers a variety of training and playing opportunities in the form of; scrimmages, team camps, clinics, guest playing opportunities, and tournament play. The Advancement phase of our development program is the area where we begin to challenge the technical, tactical, and mental components of our players. Our goal is to provide our players with the confidence to take risks and become independent decision makers. At this point travel will begin to increase with a fall season mostly based out of Sacramento and a standard tournament schedule will be aligned with our development goals. Because of our location and the need for competition there will be increased commitment from the player and family to progress with the game. Our main objective is development! Technically proficient players will be successful moving into the 11v11 game. At this level of play we are looking to compete with the best clubs in Northern California, results are not going to be a measure of success and we will stay committed to our style of play. By U13 players will now be playing the adult version of the game; they will face the increased demands and challenges that are involved at higher levels of play. Our goal as a club is to prepare the player to challenge himself/herself in a variety of environments; ODP, PDP, or USDA. This is a stage in a player’s experience where they begin to establish themselves as true soccer players and begin the process of Placement opportunities (College, etc..). The Placement phase of our program is the final progression for member of our club. This refers to those players who have made the commitment to playing soccer at the next level (high school, college, Development Academy). While it is our hope that all of our players move on to the next level we understand that soccer is a pathway for life lessons to be taught. We believe in our process of Development, Advancement, and Placement because we feel like we are providing the skills and values for our players to be successful in life. We hope that members of our program will go on to become valued professionals in every walk of life.